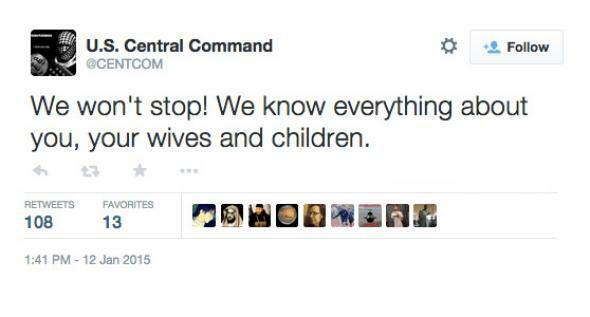 U.S. Central Command Twitter account hacked, possibly by ISIS. Hackers who say they support the terrorist group ISIS claim to have compromised U.S. Central Command. They began tweeting documents on CentCom’s Twitter account a little after noon to prove it, though it’s not yet clear that they actually infiltrated CentCom’s network or have access to confidential documents. Initial checks indicated that at least some of the supposedly confidential documents leaked by the hackers were actually publicly available. CentCom’s YouTube account was also hacked. CentCom seemed to regain partial control of its Twitter account before it was taken down completely. Both the Twitter and YouTube accounts showed pro-ISIS messages and images. Tweets included, “ISIS is already here. We are in your PCs, in each military base,” and “American soldiers, we are coming, watch your back. ISIS.” There were also messages warning American soldiers to “watch their back” and ISIS recruitment videos. In a pastebin post, a group that seems to go by CyberJihad and CyberCaliphate takes credit for the hack, though it’s not yet known whether they are the actual culprits. President Obama was already planning to discuss his recommendations and plans for government cybersecurity at events this week leading up to the State of the Union address on Jan. 20. As if there haven’t been enough hacks already, these comments could take on additional significance in light of this CentCom situation. Edward Snowden said in an interview with NOVA Next last week, “When it comes to cyber warfare, we have more to lose than any other nation on Earth.” But it doesn’t seem that the U.S. lost much here. “There is a significant difference between … a large data breach and the hacking of a Twitter account,” White House press secretary Josh Earnest told the Wall Street Journal.